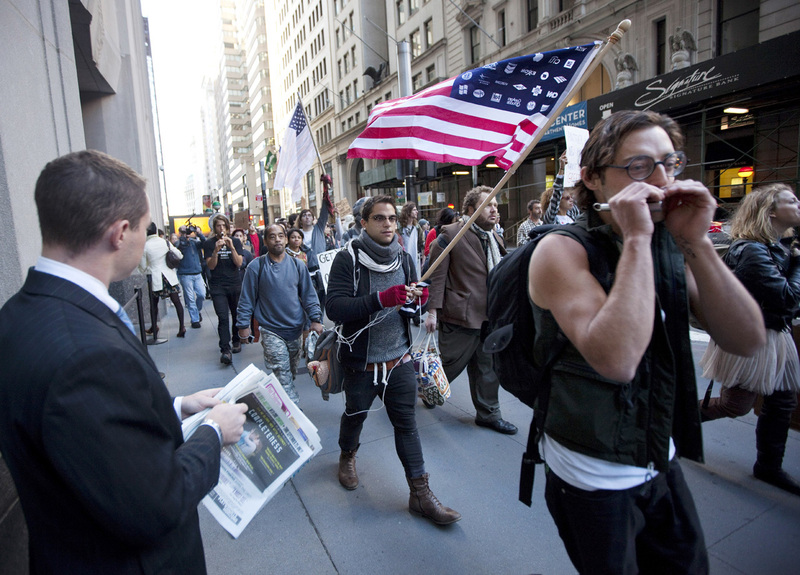 NEW YORK - At least five people were arrested on the third day of protests in New York's Financial District, spearheaded by a coalition of groups rallying against the influence of corporate money in politics. Beginning on Saturday - on what was called a U.S. Day of Rage - several groups of activists vowed to occupy Wall Street, to express their anger over a financial system they say favors the rich and powerful, and about a democratic process they deem to be corrupt. Organizers of the "Occupy Wall Street" demonstration have called for 20,000 people to "flood into lower Manhattan, set up tents, kitchens, peaceful barricades and occupy Wall Street for a few months." Channeling the occupation of Cairo's Tahrir Square by Egyptians protesting the rule of Hosni Mubarak, protesters have camped out in lower Manhattan over the weekend, seeking to occupy the center of the financial world. They hope to attract many more. Protest organizers seek to persuade President Barack Obama to establish a commission that would end "the influence money has over representatives in Washington." Their website is occupywallst.org. The demonstration's staging area in nearby Zuccotti Park (re-named Liberty Plaza) houses tents and cardboard used by those camping out. WCBS Radio correspondent Alex Silverman reports that on Monday a couple of hundred people marched behind police barricades up and down both sides of Wall Street - clogging the sidewalks as financial firm employees tried to get to work. One of the demonstrators, Robert Siegel, said that eight years working as a consultant for an investment bank was enough to turn him into a protester. "I just shuffled other people's money around and took a cut. Nothing was being contributed. A lot was just being taken out," he told Silverman. "[I] watched the silliness compound on itself. At some point, I wanted a lifestyle that didn't consist of going up to computers to deal with angry people." Four men and one woman were taken into custody Monday morning for disorderly conduct. According to The New York Times, New York City Police confirmed that arrests were made under provisions which make it illegal for two or more individuals to wear masks. Another woman was arrested as she wrote on the sidewalk in chalk.